I absolutely adore Blue Days, both the story that Calmes has penned and the way that Tremblay brings the characters to life. I've already listened to it countless times – a feat made easier by the fact that it's not quite three hours long. Seriously, I’ve stopped counting how many times I’ve listened to it, I’ve cued it up that often. That said, even if it were longer it would be on my re-listen to pile because I enjoy the story that much. Told from Dwyer's point of view, Blue Days is the story of an office infatuation that is over before it starts when the object of Dwyer's affection is placed in a position of authority over him (and because he thinks his boss is straight). While an office romance wasn't necessarily off the table (even if Dwyer didn't act on it), sleeping with the boss is... until it isn't. An unexpected business trip to the Florida Panhandle puts Dwyer in closer contact with Takeo than he ever expected and, after he gets the signal that his boss isn't as straight as he thought, Dwyer finds himself unable to keep his hands... and lips... and other body parts to himself. [And the B&B's owner wasn't the only one enjoying Takeo expressing his pleasure, loudly and repeatedly, lol.] I enjoyed how Calmes used Dwyer’s memories to show how their friendship developed over the course of about two years, particularly Dwyer’s protectiveness of Takeo. It made the outcome of their stay in Mangrove less whiplash-ish and more believable. While I'd typically say that it was unfortunate that what happened in Mangrove stayed in Mangrove, for Dwyer and Takeo, their outing may turn out to be the best thing that could have happened to them – but you'll have to read or listen to the book and decide for yourself. Personally, I recommend grabbing the audiobook because Greg Tremblay reminded me again why I enjoy his vocal performances so much. Tremblay is amazingly talented and does such a wonderful job of creating distinct voices for each of the characters, that I've yet to listen to an audiobook narrated by him and get confused as to which character is taking center stage at the time. He makes me feel the characters' emotions, giving me a front row seat on the rollercoaster ride that is Dwyer and Takeo's romance. 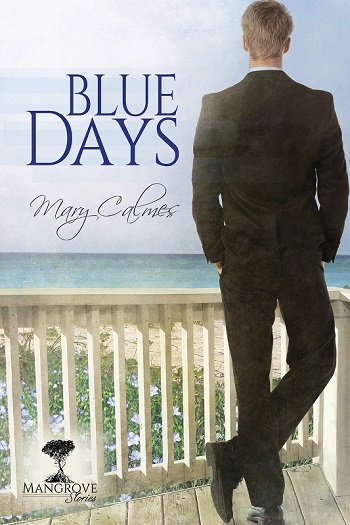 Although I initially listened to Blue Days via Audible’s Romance Package, I enjoyed it so much that I bought it and the rest of the series, so I can spend more time with Calmes and Tremblay and the interesting residents of Mangrove, Florida whenever I want – something I do quite frequently. While I enjoy the entire series, Blue Days remains my favorite installment of the Mangrove Stories. Angela reviewed her personal audiobook copy of Blue Days (Mangrove Stories #1) by Mary Calmes, narrated by Greg Tremblay for this post.